When the Statute for a European Company enters into force in October 2004, companies will have the opportunity to form an EU-wide organisation that will, in many essential areas of activity, be vested with the authority to transcend the company law of Member States. As this moment approaches, company executives and lawyers are asking many questions about the potential advantages and disadvantages of choosing to become part of this Societas Europeae (SE) that has been on the Community agenda almost from the start. This book has more answers¿clear when they can be categorically expressed, highly illuminating when dealing with the complex issues that still remain¿than any other book designed to elucidate this major new development in European law. The Statute will afford companies a far greater degree of flexibility and mobility throughout Member States than they have heretofore enjoyed. The authors of this book detail the various forms of incorporation allowed by the Statute, as well as the regulations governing share capital, transfer of registered offices, and company organs and their members. The in-depth analysis of the SE regime goes on to examine the areas in which Member State procedures will remain predominant, such as registration, publication, legal scrutiny, accounting and auditing, winding up, insolvency, and liquidation. The vexed issue of employee involvement is explored in a separate chapter. The book devotes six of its thirteen chapters to the most obvious business element on which the SE is silent¿the crucial issue of taxation. Extrapolating from a detailed examination of the European tax directives and related conventions and proposals, the authors convincingly demonstrate that the European Company Statute will necessarily expedite the harmonisation of tax laws among the Member States. In their conclusion, they present a framework for a corporate tax system that they believe is compatible with both the European company and national tax laws. The European Company Statute will be of immeasurable value to business persons, lawyers, and academics in a number of relevant fields everywhere, as it deals incisively with important matters affecting any company activity in Europe, whatever its origin. It will prove an incomparable guide to informed and rational decision making concerning European business. Introduction: Historical Background of the Statute for a European Company. PART I. 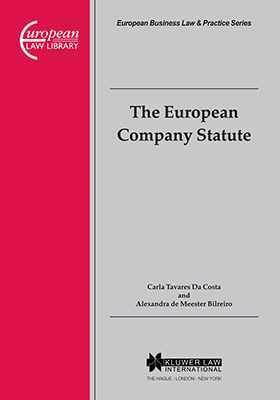 The Statute of the European Company. 1. The European Company: A Step Forward in the Community Company Law. 2. Access to the SE. 3. The Regime of the SE. 4. The Structure of the SE. 5. Annual Accounts and Consolidated Accounts of the SE. 6. Winding Up, Liquidation, Insolvency and Cessation of Payments of the SE. 7. Employee¿s Involvement in the SE. PART II. The Tax Issue. 1. Introduction to the European Tax Directives. 2. The Parent-Subsidiary Directive: General Remarks. 3. The Merger Directive: General Remarks. 4. The Arbitration Convention: General Remarks. 5. The Loss-Compensation Proposal: General Remarks. 6. Prospects of a Corporate Tax System for the European Company. Council Regulation (EC) 2157/2001 of 8 October 2001 on the Statute for a European Company (SE). Council Directive 2001/86/EC of 8 October 2001 supplementing the Statute of a European Company with regard to the involvement of employees. Council Directive 90/435/EEC of 23 July 1990 on the common taxation applicable in the case of companies and subsidiaries of different Member States (Parent-Subsidiary Directive). Council Directive 90/434/EEC of 23 July 1990 on the common system applicable to mergers, divisions, transfers of assets and exchange of shares concerning companies of different Member States (Merger Directive). Convention 90/436/EEC on the elimination of double taxation in connection with the adjustment of profits of associated enterprises (Arbitration Convention).